If you remember your Chaucer, you will know that April is the time to go on pilgrimages. 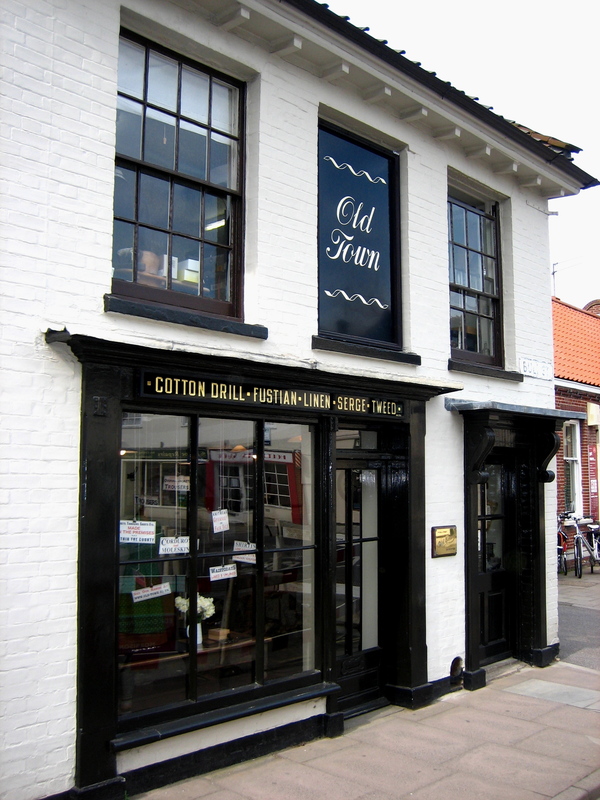 As I have not been outside London since I went to Broadstairs for the day in August, I decided to seize the opportunity of the Spring weather to make a pilgrimage to Old Town to collect my trousers that I ordered last month. Taking the train from Liverpool St up to Sheringham, I walked five miles over the hills to Holt, a small town that exemplifies the term quaint. Here in Bull St, next to the fishmonger and the butcher was my destination. On this dreamy afternoon, there were bluebells in the woods and rabbits in the hedges as I walked along lanes through attractive villages with fine churches built of flint, to arrive in Holt where second-hand bookshops and antique shops filled with Staffordshire figures beckoned. But my thought was only of trousers, and this kept my wayward footsteps directed upon the straight path that led directly to Bull St. I rang the bell and Miss Willey descended the narrow staircase to welcome me into the shop. 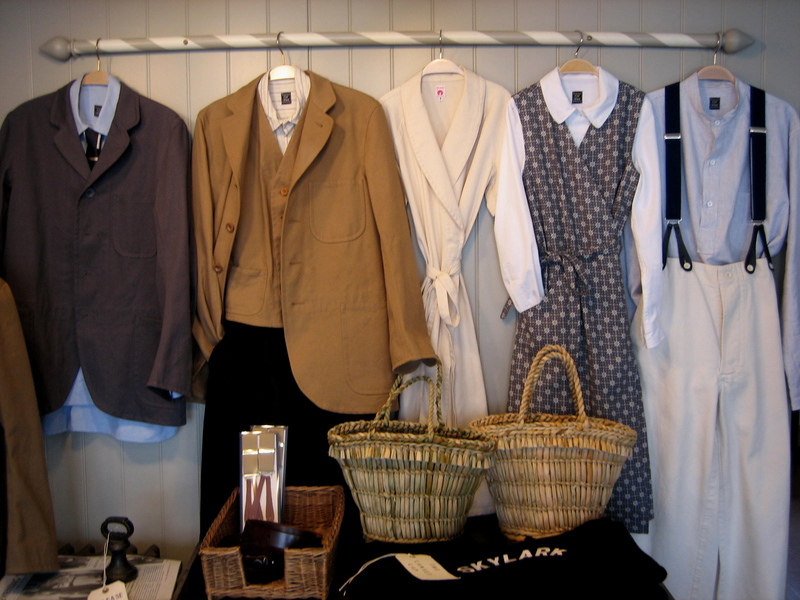 Once I saw all the clothes, I wanted to try on everything at once, but first Marie ushered me upstairs to have cup of tea and say “Hello” to Will Brown, who was working in the room above, cutting cloth. 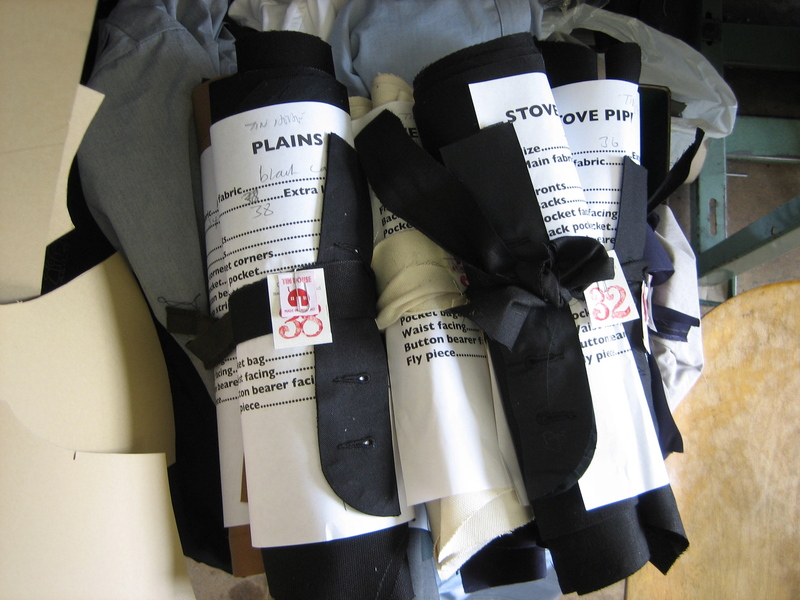 He was preparing all the pieces that make up each garment, ready for collection by the half-dozen machinists who sew the clothes together at home and deliver them back for Will to add the finishing touches later in the week. 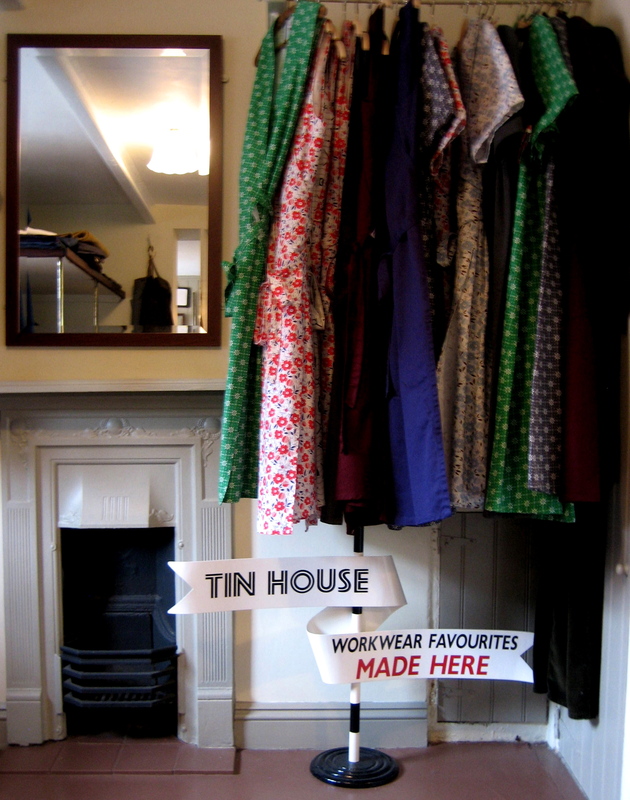 For more than ten years, with remarkable strength of mind, Marie & Will have been working here in two small rooms above their shop in this remote corner of Norfolk making their heart-warming clothes, and, as a result, today this cottage industry is working at peak capacity, selling as much as they can produce. Their unlikely success is a testament to their hard work and perseverance over all this time, pursuing the distinctive vein of workwear that is their forte and which has established them as pre-eminent in the field. Designers from Levis and Burberry sneak up to Norfolk to get a feeling for what is going on and attempt to incorporate it, but while trends ebb and flow, clothes from Old Town are classics that never go out of fashion. Informed by his knowledge of workclothes over the last century, Will Brown’s designs are not reproductions of vintage or in the style of any single period, they are a synthesis. Using mostly British fabrics, every single garment is made to order with rigorous quality control – because Marie & Will personally ensure that everything is done beautifully. Their clothes are functional without being mundane, elegant without being demonstrative, and lacking in unnecessary details while at the same time possessing good details. You can wear them everyday. Neither posh, nor bohemian, nor nerdy, they exude a levity that defies categorisation. This is the genius of Old Town. As I sipped my tea, Marie & Will chatted as they worked, without ceasing from the job in hand, inhabiting a moment of constant amused animation, moving from one task the next and doing each thing properly. 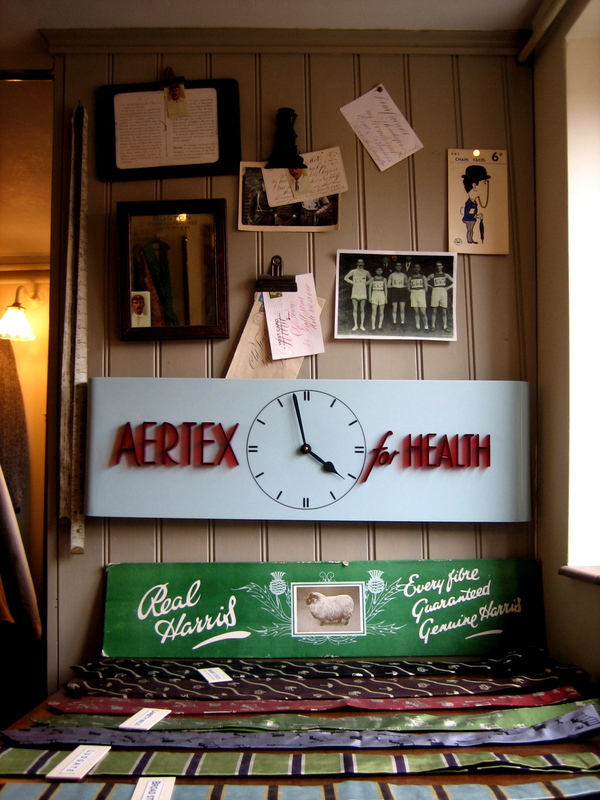 Marie was answering the phone, wrapping up parcels perfectly in brown paper and pressing clothes with a steam iron – all in a room barely six-foot square – and running downstairs to customers in the shop. As a couple, Marie & Will complement each other naturally. While Marie is flitting up and downstairs, holding it all together with indefatigable buoyancy, Will quietly works at the cutting table with efficient calm and gravity. You could say it is all a kind of performance, but you could equally say it is a lot of hard work too. The singular life they have created for themselves and the clothes they make are inseparable, and to their many appreciative customers, Marie & Will are the quiet heroes of drill and twill. 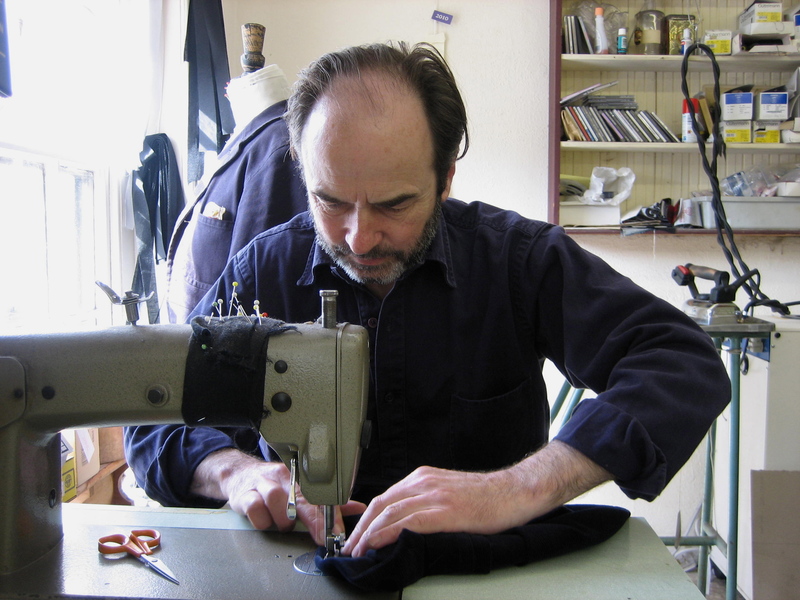 Once I had finished my cup of tea, Marie placed my newly made pair of brown tweed trousers upon the cutting table with discreet pride and I carried them downstairs to the empty shop where, all alone in a back room, I tried them on. The tweed was soft and light, with a pale brown cotton lining, bone buttons and the most beautifully embroidered button holes I ever saw. Pulling them on, my legs seemed to grow longer and as I pulled them up around my waist, I lifted my head to stand up straighter. Once they were buttoned, I pushed my hands into the pockets for the first time and raised my eyes to the mirror to admire the effect. Although these were my first pair of Old Town trousers, the effect was curiously familiar. They fitted perfectly and the design was such a masterpiece of understatement that I was at home in them at once. Before I set out for the bus stop, Marie packed my trousers into a flat cardboard box that, if it were under a Christmas tree, would create the expectation of a doll’s tea set or a model railway inside. Striding across the town square with the magic box under my arm, I was grateful to Marie & Will, not only for my wonderful tweed trousers, but also because thanks to Old Town - although it is only Spring – I already have a reason to look forward to next Winter. Well, that visit to Old Town was well worth a trip out of Spitalfields. I left you a message a while back about my own visit to Old Town wonderland when it was on a hill in Norwich. I think that this duo has a wonderful way to realize what a particularly tasteful consumer, with timeless values, would like to wear. That they have been able to keep their business going is a wonderful triumph. There really are folks out there who do appreciate their talent. Enjoy those trousers. Any chance of a picture? Well, if you’re going to leave Spitalfields…. Better make it a good trip, and I would include Holt in that, I love that little town. I have been a few times and even though one was an emergency dentist appointment while on holiday, it was a lovely surgery! I am not kidding, I almost put sugary then by accident, which probably reveals something of why I am well acquainted with dentists. Now if I pass anyone in Spitalfields in the perfect pair of tweed trousers, I will be wondering…. I shall be visiting Holt myself next week in the course of my work. I normally don’t have too much time to wander those lovely streets and lanes but I’m going to have to find where Old Town is and press my nose up against the window.